This is a book for the many people who love Maeve Binchy's writing and are so sorry she's gone. Some of the articles might not seem relevant today -- but you can hear Maeve's voice in all of them. She was always curious, always with a sparkle of humor, always insightful. She saw the people around her, with all their foibles and quirks. And oh my yes, she could write. Reading these, it's no marvel how wonderful her novels were. She was constantly sharpening her skills of observation and insight and, simply, writing. 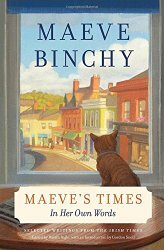 This is a cozy, friendly book for those who, through her writing, had come to think of Maeve Binchy as a friend we'll miss.